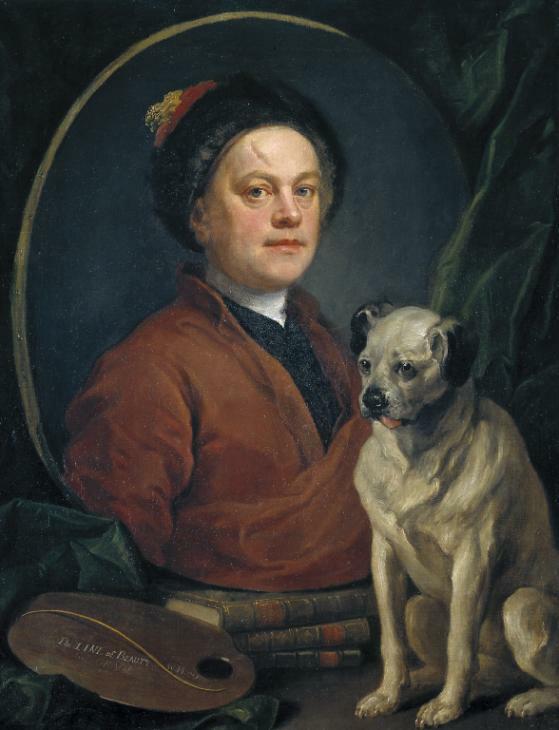 William Hogarth’s The Painter and his Pug, 1745. Oil on canvas. Purchased 1824. Tate Museum. Image source: Tate. “6-years-old and doing our favorite thing, treasure hunting at a local flea market. 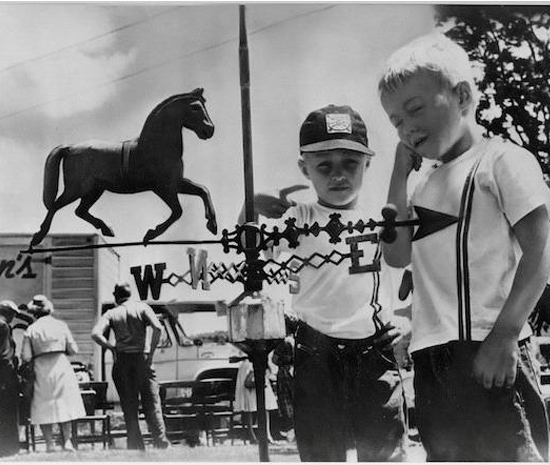 Joking around here about the way the wind is blowing, while checking out a horse weathervane that turned out to be worth very little!” Leigh and Leslie Keno. “Buried Treasure Now Online” by Lizzy Freundel. THEO – the Theodore Alexander blog (August 8, 2011). 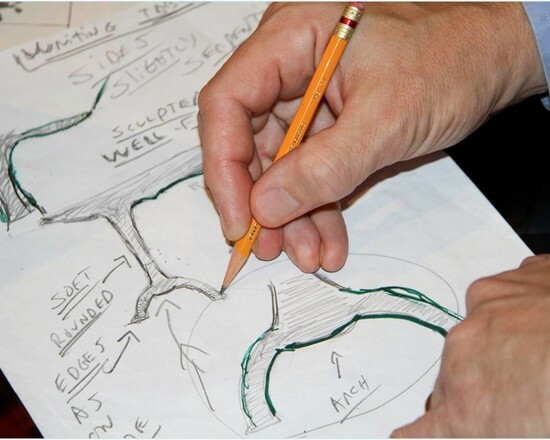 “We chose woods to accentuate the forms,” explained Leigh. Indeed, the Keno Brothers Collection for Theodore Alexander is full of Hogarth’s sensuous curves crafted from veneers that highlight the beauty of the wood. 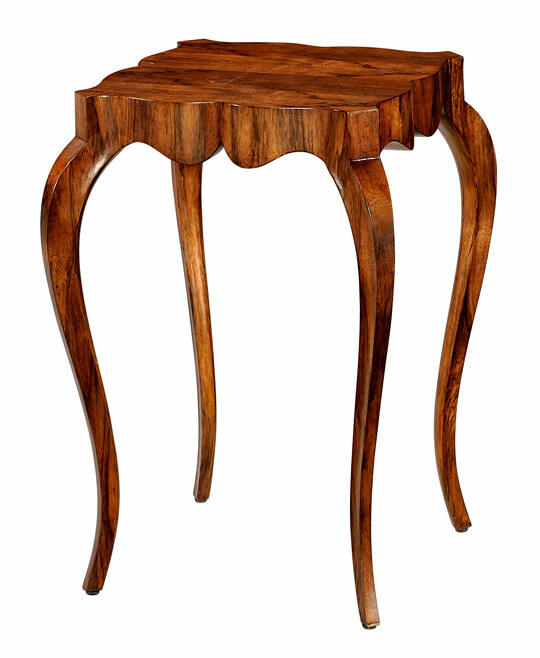 “This table embodies the essence of William Hogarth’s ‘line of beauty,’ also known as the S-curve line. Multiple curves with their undulations and points and peaks and dips lead the viewer’s eye on a ‘chase’. We offer a fresh and bold new spin on the Rococo table form in two rich shades of ofram veneer.” – Leigh Keno and Leslie Keno. Tall Fine Point II Accent table. Materials: Ofram veneer. 19-3/16” wide, 19-3/16” deep, 26-1/4” high. Available through Janet Brown Interiors. “The curvaceous silhouette of the case and legs contrast with the masterful zig-zag parquet inlay eliciting kinetic energy and movement. This is a visually exciting piece, and every time we look at it, we get the feeling that it is perfectly poised to hop, swirl, spin, swing, or step away! This table took incredible skill to create. It makes us at once marvel at the complexity of producing such a work-intensive piece and smile at the dramatic zig-zag veneers, even in the drawer interiors, a feature not found on even the very best work by 18th century Parisian ébénistes.” Leigh Keno and Leslie Keno. Dance Occasional Table. Figured Sycamore Veneer. Perota Veneer, Hyedua Veneer. Maple. Brass. Parquetry Veneered Drawer Interiors. Keno Brothers Collection for Theodore Alexander is available through Janet Brown Interiors. 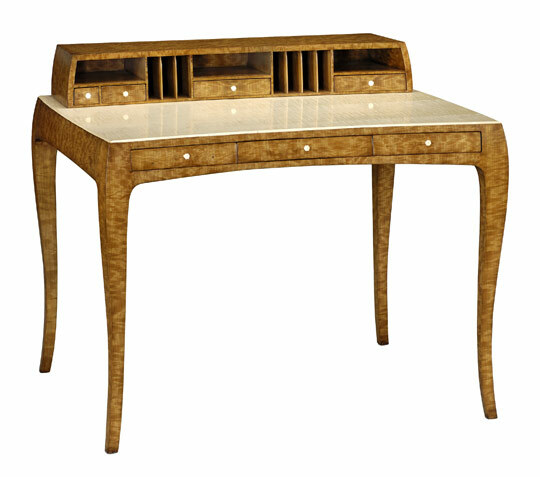 “With a convex frieze and a drawer that echoes the gentle arched line of the front of the skirt, continuing to the serpentine legs, this desk is truly a symphony of curves. 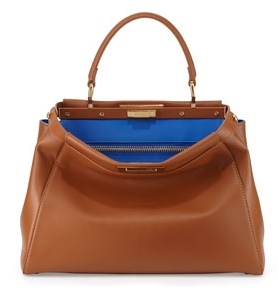 Meticulously constructed through-and-through, right down to the finely cut dovetails featuring choice figured block anegre wood with a distinguished blond sycamore writing surface. The writing compartment is a great organizer.” – Leigh Keno and Leslie Keno. The Curve I – Desk. Materials: Block Anegre veneer, Sycamore veneer, Bone Handles. 43” wide, 33-1/2” deep, 36-3/4” high. Keno Brothers Collection for Theodore Alexander is available through Janet Brown Interiors. “We have always thought furniture should be appreciated for its sculptural form as well as its functionality. 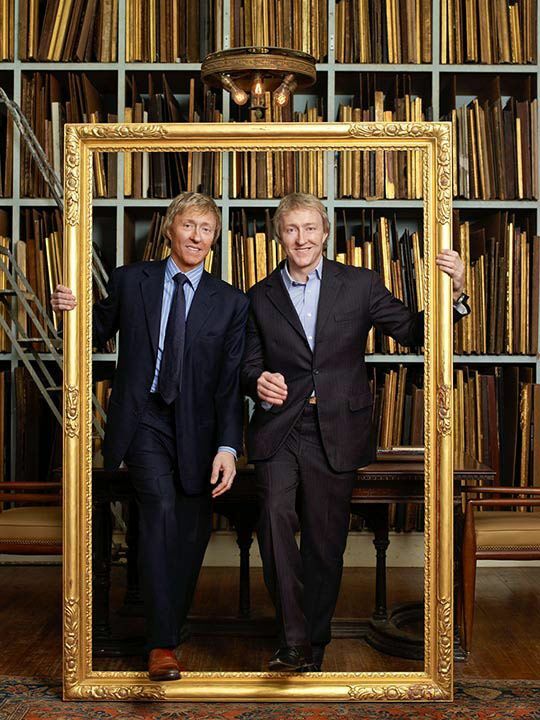 We’re inspired by our passion for classic decorative art forms, sculpture and even race-car designs.” – Leigh and Leslie Keno (“7 Questions For The Keno Brothers [Furniture Designers and Antiques Roadshow Gurus]” by Stephen Milioti, Gilt (January 27, 2014). Leigh and Leslie Keno at the 2015 Cavallino Classic examining the back end of a rare 1955 Ferrari 250 GT Europa, one of fewer than 35 ever produced. Leigh and Leslie were showing the car, which is owned by the Historic Motor Car Investment Fund, which the Kenos started earlier this year and of which they are Co-Managing Directors. The annual event is the most prestigious Ferrari event in the world and happily, the car won the Preservation Class Award for a pre-1970 Ferrari. It deserved it! Leigh and Leslie are passionate about keeping vintage cars in original condition and believe in conservation rather than restoration!” Photo copyright: Lisa M. Smith – Suixtil-USA.com. People always ask us, “What furniture is being made today that will be collectible tomorrow?” Our answer: pieces that show true craftsmanship and quality. Our goal is to make pieces that will be the “heirlooms” of the future.- Leigh and Leslie Keno (“7 Questions For The Keno Brothers [Furniture Designers and Antiques Roadshow Gurus]” by Stephen Milioti, Gilt (January 27, 2014). “Of all the furniture forms, the chair is the most personal. Chairs offer us an opportunity to have a unique interaction that we can have with no other furniture form. The Greeks, with their passion for the human body, were the first to design a chair that combined comfort and beauty – the Klismos chair. 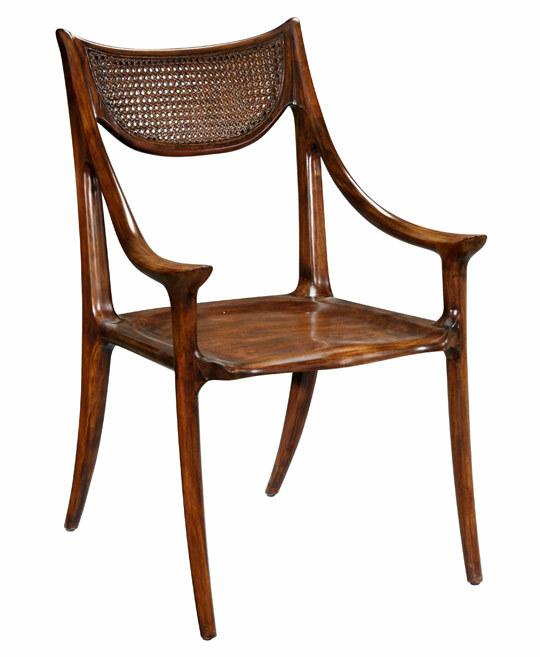 Our vision was to make a comfortable chair that is alive and organic and appears carved out all of one piece. The arms and legs form a continuous curve, and we designed the crest of the chair to be caned, which not only adds texture but also literally makes the chair ‘airy’ and cool.” – Leigh Keno and Leslie Keno.The Slope Armchair. Materials: Mahogany wood, Handwoven caning. 24” wide, 25-3/4” deep, 38” high. Keno Brothers Collection for Theodore Alexander available via Janet Brown Interiors. 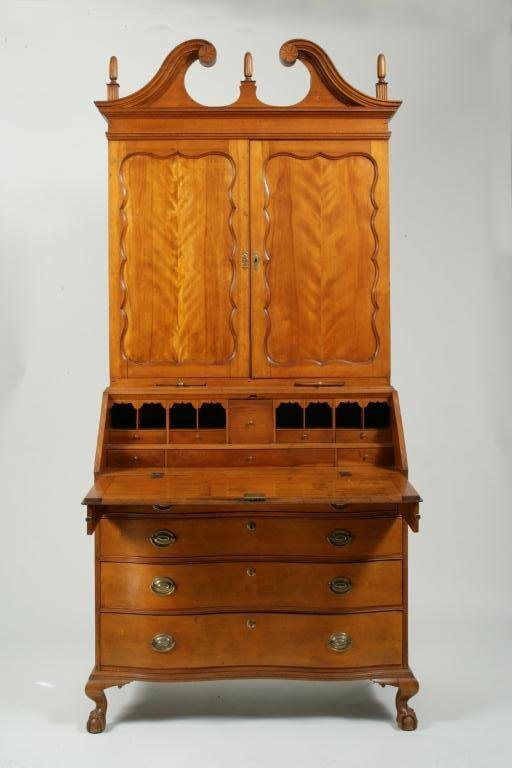 Chippendale Reverse-Serpentine Desk and Bookcase. New England, probably New Hampshire, circa 1800. This desk and bookcase is constructed of birchwood. H. (overall) 96 1/2 in. ; W. 42 in. ; D. 20 _ in. Price Realized: $12,400. 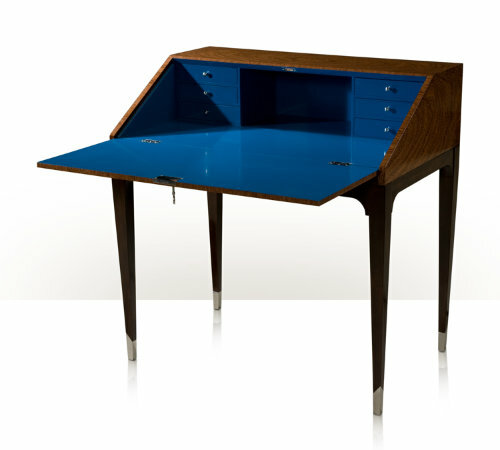 The Reveal Desk by the Keno Brothers for Theodore Alexander. Amotique Veneer. Mahogany. Blue Lacquer. Stainless Steel. Charging Unit. Kneehole width: 34″ / 86 cm. W 38 x D 24 x H 39. Keno Brothers Collection for Theodore Alexander available via Janet Brown Interiors. 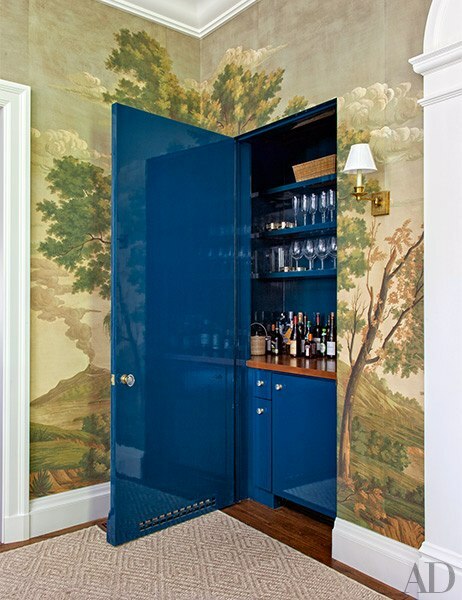 “A bar hides within a dining room wall; the sconce is from Circa Lighting. de Gournay wallpaper.” Photo: Roger Davies. Text: Mimi Read. “Miles Redd’s Latest Project Features a Paired-Down Palette” produced by Howard Christian. Architectural Digest (January 2015). One of the Keno brothers sketching a design. Image via Houzz. “We love the playful shape and movement of this tray! The unique design of the inlay gives the illusion of a wavy surface.” – Leslie Keno and Leigh Keno. “Illusion Tray” – Heyday Veneer. Chestnut Burl Veneer. Brushed Silver Leaf. Available from Janet Brown Interiors. Leigh and Leslie Keno. Image from Traditional Home via Pinterest. Come visit Janet Brown Interiors, your Richmond source for Theodore Alexander and the Keno Brothers Furniture Collection for Theodore Alexander. Post by Kathleen Sams Flippen for Janet Brown Interiors. Leslie and I would like to thank you for your very kind comments about our lifestyle Brand, Keno Bros. You captured much of the essence of what makes us tick and the things that inspire us to create the pieces in our line. As you mentioned, we are passionate about Historic cars and are inspired by the S-Shaped curves found in vintage exotic Marques such as such as Ferrari, Lamborghini, Maserati and Jaguar, to name a few. 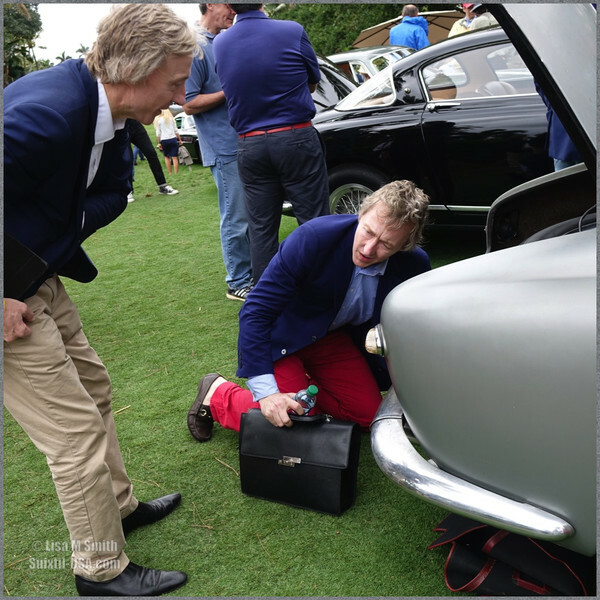 While it is true that we judge motor cars at events such as the Pebble Beach and Amelia Island Concours d’Elegances, the photo of us at the 2015 Cavallino Classic actually shows us examining the back end of a rare 1955 Ferrari 250 GT Europa, one of less than 35 ever produced. We were not judging at the event but instead were showing the car, which is owned by the Historic Motor Car Investment Fund, which we started earlier this year and of which we are Co-Managing Directors. The annual event is the most prestigious Ferrari event in the world and happily, the car won the Preservation Class Award for a pre-1970 Ferrari. It deserved it! We are passionate about keeping vintage cars in original condition and believe in conservation rather than restoration! Again, Thank you for the story!! Thank you so much for taking the time to write! I have amended the caption under the Ferrari photo. Thank you for sharing the story behind this picture! I enjoyed creating this post, and I was delighted to read your kind words. Thank you Kathleen! It is an honor to have Keno Bros. in your store! Kudos on your website!